Clare Winger Harris – The Future is Female! Clare Winger Harris in SCIENCE WONDER QUARTERLY, Fall 1929. Clare Winger Harris (January 18, 1891–October 26, 1968) is credited as the first woman to publish fiction under her own name in the science fiction specialist magazines of the 1920s. She was born Clare M. Winger in Freeport, Illinois. Her mother, Mary Stover Winger, was the daughter of the town’s richest man (inventor and industrialist D. C. Stover), and her father, Frank S. Winger, was an electrical contractor and science fiction writer who published The Wizard of the Island; or, The Vindication of Prof. Waldinger in 1917. As a child, Harris “preferred . . . the stories of Jules Verne and H. G. Wells” to more conventional girls’ fare. Graduating from Lake View High School in Chicago in 1910, she entered Smith College, but married in 1912 before completing her degree. She traveled in Europe and the Middle East, then went with her husband Frank Clyde Harris to California and Kansas, where he finished his education in architecture and engineering and where, in 1915, 1916, and 1918, she had three sons. 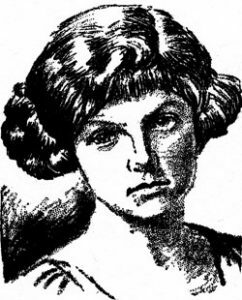 After moving with her family to Fairfield, Iowa, Harris published a historical novel, Persephone of Eleusis: A Romance of Ancient Greece (1923), and her first science fiction story, “A Runaway World,” in the July 1926 issue of Weird Tales. 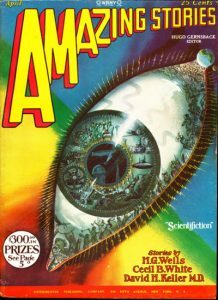 “The Fate of the Poseidonia,” in June 1927, earned Harris third place (and $100) in a contest organized by Amazing Stories publisher Hugo Gernsback and secured her place as a leading voice in science fiction. “The Ape Cycle,” which appeared in the Spring 1930 issue of Science Wonder Quarterly, was her last-known story but she continued to actively participate in the science fiction community; her August, 1931 letter to the editors at Wonder Stories, entitled “Possible Science Fiction Plots,” constitutes one of the earliest pieces of science fiction criticism. By the time of the 1940 census, Harris was divorced and living in Pasadena, California. Gathering eleven of her works in the self-published volume Away from Here and Now: Stories in Pseudo-Science in 1947, she noted that her sons had “inherited their mother’s love of science” and produced a “third generation of scientists” in the form of three grandchildren. Away From the Here and Now earned Harris one of the very first science fiction awards, granted to her by the Los Angeles Science Fiction Society. About a year before her death at seventy-seven, Harris inherited one-quarter of her grandfather’s estate, valued in excess of two million dollars. It was contested in the courts for almost sixty years.